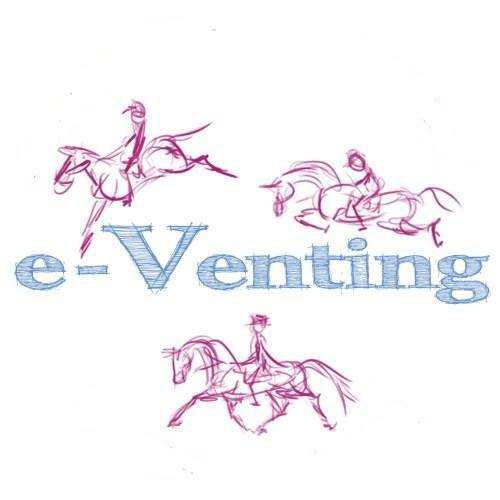 The 2013 eventing season has begun! Well, not quite the BE one but the next best thing – the traditional pipe-opener in this part of the world which is the EMDG ODE held at Osberton. 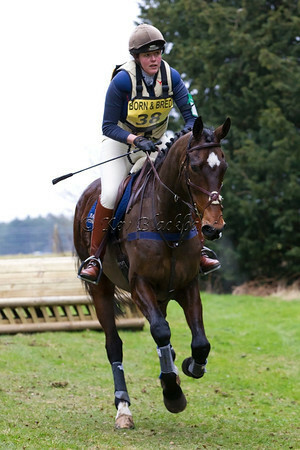 I had Jerry in the Novice (like a strong BE90) and Fugly in the Open (like a strong BE Novice – of which more later!). Jerry got day-before dressage and as the event is an extremely convenient 10mins from home I was quite happy to take him over on Saturday, get one of my 6 phases out of the way and take the opportunity to walk the courses. My bestest eventing buddy Supergroom was also here for the weekend – the first time I’ve seen her since I moved – so the stage was set for a fabby, if chilly, weekend. Jerry did a rather nice test and is definitely feeling better as a result of his time off and operations. I was pleased to get 34, which put us about 5th in the section. We left him wrapped up in about 18 rugs and contentedly munching haylage in the trailer and moseyed off to walk what I hoped would be a nice easy first-run-of-the-season XC course. A curry and a bottle of wine later the fences had assumed 4* proportions in my head so Supergroom and my husband turned their versatile hands to sports psychology and we watched a couple of vids of some of my best ever XC rounds to try to get my mind into the groove. Nice attempt, guys! Sunday morning dawned cold. Bitterly cold. Flipping freezing. With the kind of wind that we call a ‘lazy wind’. Too lazy to go round you so it cuts straight through you instead. We managed to part with our jackets and exercise rugs for long enough for Jerry to jump an OK show-jumping round for 4 faults and 1 time fault (I think they’d wheeled it for a JA pony as some people were getting double digit time faults!). Boots changed, body protector and air-jacket donned and I set off for some last-minute (and first of the season) XC schooling in the form of the XC practice fences. Then the moment that we’d been waiting a year for ‘3..2..1..go!’. Actually it was a bit of an anti-climax as the starter said ‘you can go whenever you’re ready’, but the thought was there. Jerry had a couple of little blips (one annoying one, which I won’t go into, was caused by the competitor in front of me who’d got stuck at the water jump and proceeded to take a lead from me round the rest of the course – if it had been BE I’d have complained about the incident she caused, but as it was I bit my tongue!). 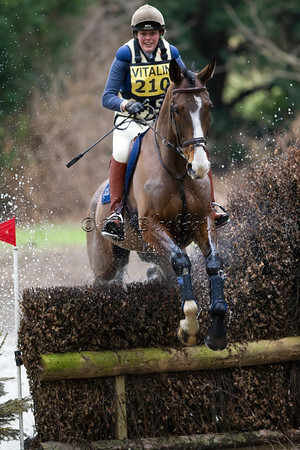 He grew in confidence round the course and I think with some XC schooling we’ll be flying. He still finished 11th, even with the blips, as the course caused a lot of bother. My husband and the dogs turned up just in time to see the least exciting bit of the day – Fugly’s dressage. He warmed up beautifully. I felt spectator’s eyes on us, and I’m sure it was for good reasons! Sadly the test was pretty atrocious. All the right things in the right places but not an ounce of harmony, fluency or elegance. To be honest I thought they’d been fairly brave scheduling a test that involved cantering down the last centre-line as a first outing of the season. I had visions of not being able to stop and cantering straight over the judge’s car! It probably didn’t help that the two competitors before me were riding their flashy Junior and YR team horses, but regardless of the company we were never going to be anything other than pretty mediocre and languished in last place after the dressage. Professional help is required! My husband was Not Impressed at being separated from the Thermatex he had appropriated as an extra layer but I felt that Fugly’s needs were greater than his. The wind picked up bringing the odd snow flurry and we got rapidly colder and colder. I felt like Tiny Tim shivering outside the windows of the other competitors’ lorries, peering enviously through their steamed-up windows. 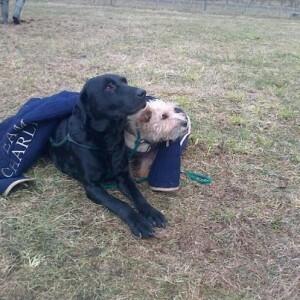 The team mascots shivering under their ‘borrowed’ Thermatex. I’d have showjumped with my winter jacket on top of my tweed if I could have done, but again rugs and outer layers had to be thrown off and Fugly managed to jump a very nice show-jumping round. I had the choice of holding or kicking at the double, and knowing that a 17.2 behemoth inevitably finds the standard 8yds a little short (especially with an oxer as the first element) I had to hold and he rolled the back pole of the oxer. Still, most people had time faults and those that didn’t had poles so I was happy with 4fts and thrilled that Supergroom thought it was the best round we’d jumped in ages. I chose not to ask her to be more specific! We then had the chance to get cold and unenthusiastic yet again whilst we waited for the XC course to be changed for the Open but it wasn’t too long before I was once again shivering in the start box being told I could go when I liked. I’d decided that the only way to make a good job of the course would be to ride like I was trying to get inside the time and deal with it in sections. If I was OK after fence 7 (the water) I’d take a deep breath and kick on the rest of the way round. So we’re all set for BE now. Fugly’s going to Oasby and Jerry to Stafford and hopefully there will be a chance to squeeze in a bit more jumping first. I said I wouldn’t be setting any goals for this season but who knows? 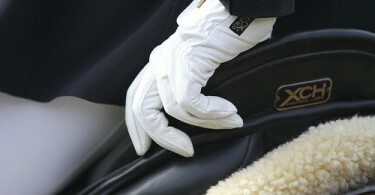 If we ever get our dressage hammered into shape (unlikely, on past experience) it will be Watch Out World! Great, really enjoyed your report! What a fab report, can feel the adrenaline rush now! Thanks! I think I may have just about thawed out now. I forgot to mention that I was also the official vet for the event so I had a lot of different hats to wear!